The 80’s and 90’s saw martial arts films in the USA going ninja crazy. So much so a lot of new films starring good folks like Sho Kosugi and others came and went, but the mystique of the dark clad assassins have always tickled the fancy of Americans. Around the mid-90’s the ninja craze was already fading, but not before an overlooked film would wind up being the best of the American ninja films. Three words: Bullet. Train. Sequence. More about that later. The film begins as we meet Paul Racine (Lambert) a computer tech executive from New York who is attending a business meeting in Tokyo, and while hanging out at a bar meets Kirina (Chen), a beautiful woman that Racine takes out and has a fabulous night, and after he leaves Kirina’s apartment, she is ambushed and marked for assassination by the ninja Kinjo (Lone) of the Makato Clan. No one has seen Kinjo’s face, but Kirina defiantly requests to, and he obliges her as this is his last kill, but Racine returns to her room unexpectedly, and is badly injured by the other ninjas, but not before seeing Kinjo’s face, and seeing Kinjo behead Kirina. This is a scene where Takeda, protecting Racine, starts at one end of the train, where on the other end, ninjas are making their way to the back, killing every single human being between them and Racine, meaning we get to see ninjas wiping out passengers by the dozens. 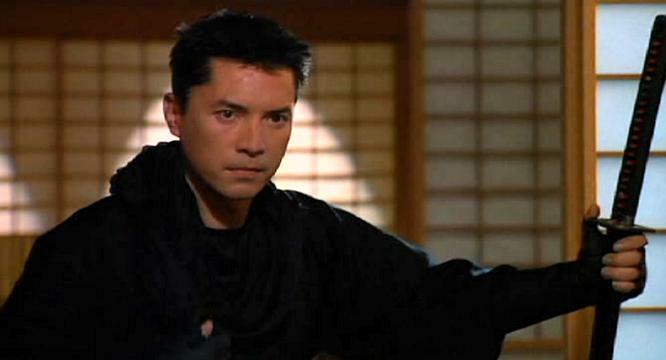 It’s a tense scene, and once Takeda makes his way to them, you cheer when he starts slicing and dicing ninjas. It’s a great sequence and the camerawork does exactly what it needs to, and it’s not editing in quick cuts like so many American martial arts films tend to do. The sword fighting is well done here, and last exactly as long as each confrontation should, which as in many samurai films, is begun and ended quickly. The other set pieces are well done, particularly the final fights including the Kinjo vs. Takeda fight, which is shot well, and gives a sense of space between the actors fighting, something overlooked in many swordfighting films. Once Christopher Lambert takes over, it all goes out the window for some deus ex machina moments in order for Lambert to become victorious. The bullet train sequence is one of the best “ninja” moments in the history of ever. A great film that is easily the best of the American ninja film genre. I concur with your evaluation and assessment of this movie. Absolutely loved it and love your writing style.